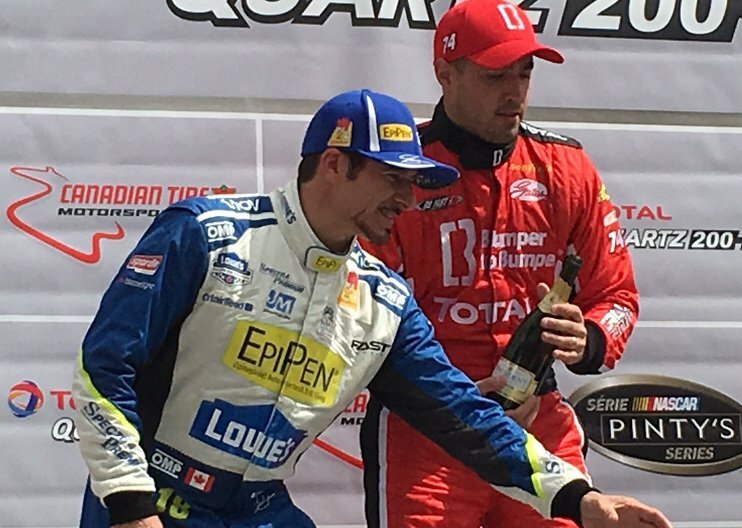 Second place podium finish for Alex Tagliani, pictured on the left, next to NASCAR Pinty's race winner Kevin Lacroix. Alex Tagliani finished second on Sunday in Round 11 of 13 of the NASCAR Pinty's Series held at Canadian Tire Motorsport Park's quick 3.958-km road course (CTMP), located 90 kms east of Toronto. Starting third, the Quebec driver kept his number 18 EpiPen-Lowe's-St Hubert-Spectra Premium racecar within reach of the leaders throughout the first 46 of the 51-lap Total Quartz 200, finally taking over second place on lap 47. This is Tagliani's best result on this track in this series; his previous best was a fifth place in 2008 in his first series race at CTMP. "This is a very good result," Tagliani said. "It was a caution free race and even though the car was not performing at its peak in the rain, we pulled off a great second place finish. We didn't quite get the right setup during our pit stop so the car started understeering when the track began to dry. When there are no yellows in a race and you get bottled up in lapped traffic, these things start to matter because there is no place to recuperate. But ultimately we scored a bunch of points and I am satisfied by the hard work done by the Tagliani Autosport/22 Racing team. I can't complain with a second place finish in the Pinty's series and another one in the CTCC." Kevin Lacroix won the race ahead of Tagliani, with Andrew Ranger coming home in third place. Anthony Simone and LP Dumoulin round up the top five. Twenty-four drivers started the race and 23 crossed the finish line with only six on the lead lap. This race was the first NASCAR Pinty's Series event to run caution free since the 2015 race at Circuit ICAR. With two races left this year in the NASCAR Pinty's Series, Tagliani is still sixth in the standings with 405 points, but managed to further close the gap to fifth place which is held by Louis-Philippe Dumoulin. Twelve points separate the drivers. Race winner Kevin Lacroix maintains second place in the points chase (470-440) behind Alex Labbé who finished sixth on Sunday. Top ten positions look secure unless a driver misses a race. In 56 NASCAR Pinty's Series starts, Tagliani has six wins, eight poles, 22 top-fives and 36 top-ten finishes. Telecast for the Total Quartz 200 will be aired Saturday, September 9 at 2:30 p.m. on TSN. The weekend started on a positive note for Tagliani who drove his Ford Mustang Fast Wheels to second place overall in the Canadian Touring Car Championship race held on Friday. In the NASCAR Camping World Truck Series: After qualifying 12th out of 32 trucks on Saturday, Tagliani was hoping for rain for Sunday's Chevrolet Silverado 250 main event, but it never came. In the first of three NASCAR stages, he drove his Canadian sponsored no 02 Spectra Premium Chevrolet to 11th overall. Unfortunately, a fuel pick-up problem in stage two while running sixth forced him to pit early. Following a refuel, the driver for the Young's Motorsports team from Mooresville, North Carolina, returned to the track near the rear of the field but climbed back to finish 19th overall, one lap down on race winner Austin Cindric. "Our results in the truck race were tough to take because things looked good at the start," continued Tagliani. "Our race rhythm was great and I even posted third fastest lap of the race. I was supposed to pit for fuel on lap 34, but the fuel pick up started to jam on lap 29 and I suddenly started to slow down while in heavy traffic. We lost a couple of laps trying to figure out the problem and restart the engine, but I got one lap back. Who knows what the outcome might have been if this problem had not occurred? It's disappointing for Young's Motorsports and for our sponsor Spectra Premium because we looked good out there for a while." Next stop: The NASCAR Pinty's Series (NPS) visits Autodrome Saint-Eustache, Quebec on Saturday, September 9 for round 12 of 13 of the 2017 schedule. Alex Tagliani will visit the RONA l'Entrepôt located at 440 Dubois street in Saint-Eustache, Quebec (J7P 4W9) this Friday from 4 to 8:00 p.m. to meet with race fans, customers and store employees. Tagliani will be on hand for a promotional visit with the #18 EpiPen-Lowe's-St Hubert-Premium Spectra racecar, Tagliani Autosport transporter and crew. Fans are invited to enter pit stop competitions and join Alex for autograph sessions and photo ops. Tagliani will also talk about the interactive online Food Allergy Canada's Drive the Discussion Contest at the foodallergycanada.ca/tag. During these events, Lowe's Canada joins with EpiPen to promote emergency treatment of anaphylactic reactions, which can happen when some people are exposed to a usually harmless substance called an allergy trigger. EpiPen, another major sponsor of Alex Tagliani, manufactures EpiPen® Auto-Injectors for the emergency treatment of anaphylactic reactions. Enter Food Allergy Canada's Drive the Discussion Contest today! This summer, join Canadian race car star Alex Tagliani in the Summer of TAG 2017, as he races across Canada and helps raise awareness about food allergies and the importance of educating others along the way! Everyone can join the food allergy conversation in the Drive the Discussion Contest by posting his favourite food allergy tip on how to safely manage food allergies that can be shared with others. Each post qualifies them for a chance to win one of five weekly prizes and/or a grand prize from Lowe's/RONA. Don't forget to share your tip with a friend - if they comment on your tip, then they will be eligible to win: go to foodallergycanada.ca /tag.